They tend to maintain a loose grouping when tamed, all rising together, moving to the grazing area, all grazing and then all returning to their favourite spot. 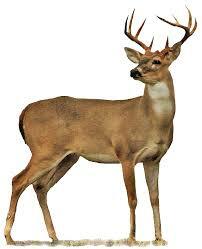 White-Tailed deer can run rather quickly and jump really high due to the their long legs. Their speed decreases in the thick snow. Their ability to run fast is their protection against predators. Keen senses of smell, vision and hearing have a lot to do with deer "intelligence. "Deer often sense the presence of hunters long before hunters sense them. On average in Pennsylvania, 56% of farmers report problems with deer and over $1.7 million in agriculturedamage was caused by deer alone. Pennsylvania farmers suffer crop damage of an estimated $30 million annually. New Jersey agriculture damage is estimated to exceed $10 million. Cost of night guard + 2 acres vegetables.